Essential Eye Cream relies on honey as its nutrient base to fight aging around your eyes, moisturize it and also infuse it with antiseptic healing properties. We review this bee-based formula to see how hard it can work and if it can tackle all the issues associated with the eyes: puffiness, dullness, lines, and wrinkles. There are certain criteria as clinically researched, vetted, approved and backed up by consistent trial data that is used as the benchmark for eye creams. Let’s see how will this product potentially measures up! The manufacturer does not use ordinary honey, but aged honey. It undergoes a 60-day fermentation process which purportedly enhances its healing, soothing properties. 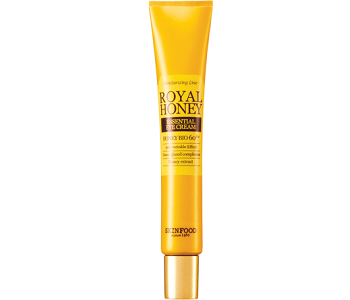 Propolis is used as the sealant to lock in the moisture while Royal (bee) jelly is used to increase collagen production. Propolis is like bee ‘glue’. Honey may be nutrient rich and moisturizing but the issue is that in cosmetic trials, honey has been studied as an antibacterial that is great for healing wounds, not as an anti-aging agent. Other than collagen, we are missing a host of must-have ingredients including alpha-hydroxy acids, algae antioxidant extracts, passionflower, Vitamin E, Alpenrose and more. Possibly, due to the anti-inflammatory properties of honey, it may reduce puffiness. But there is little to suggest it will smooth out those lines and keep skin tight and bright long-term. Toney the eye area. Apply the cream around your eyes gently. Dab it in and do not rub as the eye area is delicate. The cream sells for $30 for 30 ml. There are no discounts. We could not find any evidence of a guarantee policy or returns policy. This puts you in danger of buying a product that may not work, leaving you without any way of getting your money back. It also may mean you are putting time and effort into correcting your eye area in vain. On the product website, 80% of consumers give it a high rating. Interestingly, the reviews on Amazon are similarly positive. We like that the product is cruelty-free. It also goes some way to some way towards sustaining beehive populations which is important for the planet as a whole. Unfortunately, though, the product is almost entirely devoid of hard-working clinically proven ingredients. These include but are not limited to alpha-hydroxy acids, algae antioxidant extracts, passionflower, Panthenol, Vitamin E, and Alpenrose. The product may work in part to reduce puffiness, given its soothing properties. When measured against leading, consistent and proven research criteria, as borne out in numerous practical trials, it is simply not clear – to put it mildly – how this formulation will provide firmness and regeneration long-term. Best-in-class products with proven clinical efficacy contain at least five patented ingredients for a reason. Look for this if you opt to use a product you know will produce results, and make sure that unlike this one, it has a strong guarantee policy in place.